Many truck accidents cases in Maryland are caused when eighteen wheel trucks' axle brakes lock up. This causes the truck to go into a skid, and the trailer swings out and stops, forming a 90-degree angle with the truck. Truck collisions due to jackknifing often occur when the drive wheels are locked when they reach a slick spot while the front wheels and the trailer continue rolling forward. What is the definition of a jackknifing? This is where the trailer or tractor loses rolling traction due to some driver input, most often improper braking techniques or speed too fast for conditions, and swings perpendicular to the other. A jackknife can occur in a second in good conditions and even faster if the conditions are slick. Sometimes you cannot avoid jackknifing. But often it is avoidable with the proper skill and training. The technique to attempt a recovery from a loss of traction is to remove your foot from the accelerator and brake and disengage the clutch. This allows all the wheels to turn freely, giving the CMV driver his/her best chance for recovery. The worst thing a driver can do is lock his/her brakes. But truck drivers often panic. What causes the peril that leads to jackknifing in the first place? There are many causes. One major cause of overbraking in inclement weather. The CDL Manual states, on slippery surfaces, you should not brake harder than necessary. You should adjust speed to conditions, don't pass slower vehicles, go slow, watch far enough ahead to keep a steady speed and avoid having to slow down and speed up. The CDL Manual also states that when you see a traffic jam ahead, slow down or stop and wait for it to clear. The Tractor-Trailer Drivers Handbook says that driving too fast for conditions causes most of the severe skids. The reduced visibility reduces the time a CMV driver has to react to hazards and therefore increases the likelihood of over-braking and over-steering. Jackknifing can occur at speeds as low as five miles per hour. Some trucks are more likely to jackknife. For example, a half-empty tanker is more than twice as likely to be involved in a jackknifing truck accident than a fully loaded semi-truck (which is also at great risk for jackknifing). Slippery roads can also cause a truck accident from jackknifing. 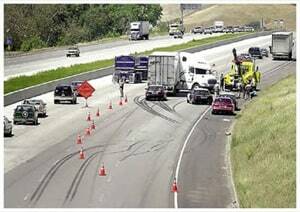 As truck accident lawyers in Maryland, our attorneys are often arguing that the slippery conditions required more prudent driving by the truck driver given the hazardous condition. Our lawyers have learned that truck accidents from jackknifing can be avoided by prudent breaking. When an eighteen wheel truck driver is required to hit the breaks, he has three basic braking options in his effort to prevent a truck accident. The truck driver can (1) lock up the steering axle brakes, (2) he can lock the drive axles or (3) he can lock the trailer axles. The potential outcomes depend upon which option the driver chooses. If the driver attempts to avoid the truck accident by locking up the steering axle brakes, the eighteen-wheelers will typically straighten under most road conditions. But if the driver seeks to avoid the truck accident by locking the drive axles, the truck is more likely to jackknife. The worst option - and the most common in causing truck accidents - is when the driver locks up the trailer brakes. This leads to a trailer swing that frequently leads to a truck accident. A good, experienced truck driver should know how to navigate these situations. Many don't. And the results can be catastrophic. If you have been seriously injured in a truck accident from jackknifing and are looking for Maryland truck accident attorneys experienced in handling truck accident cases on behalf of injured victims, get a free consultation online or call 800-553-8082.